The French Minister responsible for Parliamentary Relations, Alain Vidalies, has recently conceded that EUR10bn (USD12.7bn) is needed to balance the country’s budget this year, to be achieved notably by means of implementing a number of emergency tax measures. …The government plans to abolish the exemption from social contributions applicable to overtime hours, expected to yield a gain for the state of around EUR3.2bn, and to subject overtime hours to taxation, predicted to realize approximately EUR1.4bn in additional revenues. Other proposed measures include plans to reform the country’s solidarity tax on wealth (ISF), to cap tax breaks at EUR10,000, to impose a 3% tax on dividends and to increase the inheritance tax as well as the tax on donations. 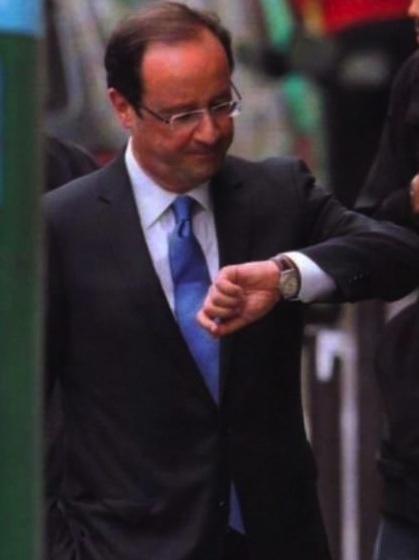 …French President Hollande announced plans during his election campaign to reform ISF. Holland intends to restore the wealth tax scale of between 0.55% and 1.8%, in place before the former government’s 2011 reform, to be applied on wealth in excess of EUR1.3m. Currently a 0.25% rate is imposed on net taxable wealth in excess of EUR1.3m and 0.5% on net taxable assets above EUR3m. France already has the highest tax burden of any non-Scandinavian nation, so why not further squeeze the productive sector? That’s bound to boost jobs and competitiveness, right? And more revenue as well! Monti also is a big supporter of eurobonds, whichs make a lot of sense if you’re the type of person who likes co-signing loans for your unemployed alcoholic cousin with a gambling addiction. But let’s not forget our Greek friends, the ones from the country that subsidizes pedophiles and requires stool samples from entrepreneurs applying to set up online companies. Gee, isn’t this just peachy? Best of all, thank to the IMF, the rest of us are helping to subsidize these Greek moochers. Let’s translate this into plain English: The IMF wants more money from American taxpayers (and other victimized producers elsewhere in the world) to subsidize the types of statist policies that I described above in places such as France, Italy, and Greece. I wrote last year about a tax protest in Ireland, and I wrote earlier this year about a tax revolt in Greece. But Irish and Greek taxpayers are wimps compared to their Italian compatriots. When Italians decide to have a tax revolt, they don’t kid around. Here are some remarkable details from the UK-based Telegraph. As much as I despise high taxes, I don’t think petrol bombs are the answer. But I am glad that at least some of the bureaucrats feels shame about their jobs. Not surprisingly, the political elite wants people to be deferential to predatory government. Annamaria Cancellieri, the interior minister, said she was considering calling in the army in a bid to quell the rising social tensions.“There have been several attacks on the offices of Equitalia in recent weeks. I want to remind people that attacking Equitalia is the equivalent of attacking the State,” she said in an interview with La Repubblica newspaper. Here’s some advice for Ms. Cancellieri: Maybe people will be less likely to attack “the State” if “the State” stops attacking the people. But don’t expect that to happen. The Prime Minister also demands obedience to “the State” and there’s rhetoric about “paying taxes is a duty” from other high-level government officials. Keep in mind, by the way, that this is the government that supposedly is being run by brilliant technocrats, yet they are so incompetent that they appoint the wrong people to posts. But the real problem is that government is far too big, consuming one-half of Italy’s economic output. If Italy’s political class wants to improve tax compliance, they should listen to the IMF and academic economists, both of whom point out that lower tax rates reduce incentives for evasion and avoidance. It also would help to shrink the burden of the public sector. Unfortunately, as is the case with most other European nations, “austerity” in Italy mostly means higher taxes, not less spending. With both France and Greece deciding to jump out of the left-wing frying pan into the even-more-left-wing fire, European fiscal policy has become quite a controversial topic. But I find this debate and discussion rather tedious and unrewarding, largely because it pits advocates of Keynesian spending (the so-called “growth” camp) against supporters of higher taxes (the “austerity” camp). Since I’m a big fan of nations lowering taxes and reducing the burden of government spending, I would like to see the pro-tax hike and the pro-spending sides both lose (wasn’t that Kissinger’s attitude about the Iran-Iraq war?). Indeed, this is why I put together this matrix, to show that there is an alternative approach. One of my many frustrations with this debate (Veronique de Rugy is similarly irritated) is that many observers make the absurd claim that Europe has implemented “spending cuts” and that this approach hasn’t worked. Here is what Prof. Krugman just wrote about France. The French are revolting. …Mr. Hollande’s victory means the end of “Merkozy,” the Franco-German axis that has enforced the austerity regime of the past two years. This would be a “dangerous” development if that strategy were working, or even had a reasonable chance of working. But it isn’t and doesn’t; it’s time to move on. …What’s wrong with the prescription of spending cuts as the remedy for Europe’s ills? One answer is that the confidence fairy doesn’t exist — that is, claims that slashing government spending would somehow encourage consumers and businesses to spend more have been overwhelmingly refuted by the experience of the past two years. So spending cuts in a depressed economy just make the depression deeper. So let’s take a look at the actual data and see how much “slashing” has been implemented in France and the United Kingdom. Here’s a chart with the latest data from the European Union. I’m not sure how Krugman defines austerity, but it certainly doesn’t look like there’s been a lot of “slashing” in these two nations. To be fair, government spending in the United Kingdom has grown a bit slower than inflation in the past couple of years, so one could say that there’s been a very modest bit of trimming. There’s been no fiscal restraint in France, however, even if one uses that more relaxed definition of a cut. The only accurate claim that can be made about France is that the burden of government spending hasn’t been growing quite as fast since the crisis began as it was growing in the preceding years. This doesn’t mean there haven’t been any spending cuts in Europe. The Greek and Spanish governments actually cut spending in 2010 and 2011, and Portugal reduced outlays in 2011. But you can see from this chart, which looks at all the PIIGS (Portugal, Italy, Ireland, Greece, and Spain), that the spending cuts have been very modest, and only came after years of profligacy. Indeed, Greece is the only nation to actually cut spending over the 3-year period since the crisis began. Krugman would argue, of course, that the PIIGS are suffering because of the spending cuts. And since there actually have been spending cuts in the last year or two in these nations, does that justify his claims? What I would argue, though, is that these nations have no choice but to bite the bullet and reduce the burden of government. The only other alternative is to somehow convince taxpayers in other nations to make the debt bubble even bigger with more bailouts and transfers. But that just makes the eventual day of reckoning that much more painful. Additionally, I think much of the economic pain in these nations is the result of the large tax increases that have been imposed, including higher income tax rates, higher value-added taxes, and various other levies that reduce the incentive to engage in productive behavior. So what’s the best path going forward? The best approach is to implement deep and meaningful spending cuts, and I think the Baltic nations of Estonia, Lithuania, and Latvia are positive role models in this regard. Let’s look at what they’ve done in recent years. As you can see from the chart, the burden of government spending was rising at a reckless rate before the crisis. But once the crisis hit, the Baltic nations hit the brakes and imposed genuine spending cuts. The Baltic nations went through a rough patch when this happened, particularly since they also had their versions of a real estate bubble. But, as I’ve already argued, I think the “cold turkey” or “take the band-aid off quickly” approach has paid dividends. The key question is whether nations can maintain spending restraint, particularly when (if?) the economy begins to grow again. Even a basket case like Greece can put itself on a good path if it follows Mitchell’s Golden Rule and simply makes sure that government spending, in the long run, grows slower than the private economy. The way to make that happen is to implement something similar to the Swiss Debt Brake, which effectively acts as an annual cap on the growth of government. In the long run, of course, the goal should be to shrink the overall burden of government to its growth-maximizing level. On May 20, the 2012 NATO Chicago summit will bring together the heads of state from the alliance. The agenda reads like a rundown of major world events in the past two years: the Arab Spring, the Libyan civil war, the global financial crisis, and the war in Afghanistan. It seems no problem is too big for NATO. Of these topics, the most pressing and headline-grabbing will be the plan NATO and the United States establish to gradually turn responsibility for security in Afghanistan over to the Afghan national forces. But also of note are the topics—“lessons learned from Libya,” and the “Smart Defense Initiative,”—that display the reliance of Europe on the United States for advanced military capabilities. Libya in particular showcased Europe’s inability to act without the U.S. The lessons from Libya are two-fold, and it is important to keep them in mind as policymakers and pundits in Washington call for the next U.S. intervention, possibly in Syria or Iran. First, the results so far have been disappointing for America’s latest stab at coercive democratization. Libya also was a disappointment as a supposed new model for U.S. intervention. In fact, that conflict reinforces the fact that NATO really stands for North America and The Others. Without the U.S., the Europeans would be essentially helpless. Despite widespread praise in Western capitals for NATO’s leadership of the air campaign in Libya, a confidential NATO assessment paints a sobering portrait of the alliance’s ability to carry out such campaigns without significant support from the United States. The report concluded that the allies struggled to share crucial target information, lacked specialized planners and analysts, and overly relied on the United States for reconnaissance and refueling aircraft. This should surprise no one. After all, during the war against Serbia—another nation which had not threatened America or any American ally—Europe was estimated to have a combat effectiveness less than 15 percent that of the U.S. The Europeans had large conscript armies, but outside of Britain and France had very little ability to project power. Later European participation in Afghanistan has been marred by the dozens of national “caveats” limiting participation in combat. Yet alliance expansion is also on the agenda for the May NATO summit in Chicago. The list of alliance-wannabes includes such powerhouses as Macedonia, Montenegro, and Bosnia. Former Soviet republics notable mostly for their tangled and/or troubled relations with Russia—Georgia and Ukraine—are also on the list. All of these nations would be security liabilities, not assets, for America. As the NATO study demonstrates, should the alliance’s Article 5 commitment get invoked, America would do most of the fighting. It would be one thing to take that risk where vital interests were at stake. But they are not in the Balkans, let alone in the Caucasus, which was part of Imperial Russia even before the Soviet Union. Alliances should reflect the security environment. The Cold War is over. The Europeans have developed, the Soviet Union is kaput, and the potential European conflicts of the future—distant and unlikely—are linked to no hegemonic threat against America. Instead of talking about NATO expansion, the U.S. should set down the burden of defending Europe. Let the Europeans take over NATO or create their own European defense organization, as they have discussed for years. The latest reminder of Europe’s relative military ineffectiveness reinforces the case for ending the continent’s cheap ride. It is time to turn North America and The Others into simply The Others. When Ronald Reagan said that big government undermined the economy, some people dismissed his comments because of his philosophical belief in liberty. And when I discuss my work on the economic impact of government spending, I often get the same reaction. This is why it’s important that a growing number of establishment outfits are slowly but surely coming around to the same point of view. This is remarkable. It’s beginning to look like the entire world has figured out that there’s an inverse relationship between big government and economic performance. That’s an exaggeration, of course. There are still holdouts pushing for more statism in Pyongyang, Paris, Havana, and parts of Washington, DC. But maybe they’ll be convinced by new research from the World Bank, which just produced a major report on the outlook for Europe. In chapter 7, the authors explain some of the ways that big government can undermine prosperity. There are good reasons to suspect that big government is bad for growth. Taxation is perhaps the most obvious (Bergh and Henrekson 2010). Governments have to tax the private sector in order to spend, but taxes distort the allocation of resources in the economy. Producers and consumers change their behavior to reduce their tax payments. Hence certain activities that would have taken place without taxes, do not. Workers may work fewer hours, moderate their career plans, or show less interest in acquiring new skills. Enterprises may scale down production, reduce investments, or turn down opportunities to innovate. …Over time, big governments can also create sclerotic bureaucracies that crowd out private sector employment and lead to a dependency on public transfers and public wages. The larger the group of people reliant on public wages or benefits, the stronger the political demand for public programs and the higher the excess burden of taxes. Slowing the economy, such a trend could increase the share of the population relying on government transfers, leading to a vicious cycle (Alesina and Wacziarg 1998). Large public administrations can also give rise to organized interest groups keener on exploiting their powers for their own benefit rather than facilitating a prosperous private sector (Olson 1982). In other words, government spending undermines growth, and the damage is magnified by a poorly designed tax policies. The authors then put forth a theoretical hypothesis. …economic models argue that the excess burden of tax increases disproportionately with the tax rate—in fact, roughly proportional to its tax rate squared (Auerbach 1985). Likewise, the scope for self-interested bureaucracies becomes larger as the government channels more resources. At the same time, the core functions of government, such as enforcing property rights, rule of law and economic openness, can be accomplished by small governments. All this suggests that as government gets bigger, it becomes more likely that the negative impact of government might dominate its positive impact. Ultimately, this issue has to be settled empirically. So what do the data say? These are important insights, showing that class-warfare tax increases are especially destructive and that government spending undermines growth unless the public sector is limited to core functions. Then the authors report their results. Figure 7.9 groups annual observations in four categories according to the share of government spending in GDP during that year. Both samples show a negative relationship between government size and growth, though the reduction in growth as government becomes bigger is far more pronounced in Europe, particularly when government size exceeds 40 percent of GDP. …we provide new econometric evidence on the impact of government size on growth using a panel of advanced and emerging economies since 1995. As estimates can be biased due to problems of omitted variables, endogeneity, or measurement errors, it is necessary to rely on a broad range of estimators. …They suggest that a 10 percentage point increase in initial government spending as a share of GDP in Europe is associated with a reduction in annual real per capita GDP growth of around 0.6–0.9 percentage points a year (table A7.2). The estimates are roughly in line with those from panel regressions on advanced economies in the EU15 and OECD countries for periods from 1960 or 1970 to 1995 or 2005 (Bergh and Henrekson 2010 and 2011). These results aren’t good news for Europe, but they also are a warning sign for the United States. The burden of government spending has jumped by about 8-percentage points of GDP since Bill Clinton left office, so this could be the explanation for why growth in America is so sluggish. Last but not least, they report that social welfare spending does the most damage. Governments are big in Europe mainly due to high social transfers, and big governments are a drag on growth. The question is whether this is because of high social transfers? The answer seems to be that it is. The regression results for Europe, using the same approach as outlined earlier, show a consistently negative effect of social transfers on growth, even though the coefficients vary in size and significance (table A7.4). The result is confirmed through BACE regressions. High social transfers might well be the negative link from government size to growth in Europe. The last point in this passage needs to be emphasized. It is redistribution spending that does the greatest damage. In other words, it’s almost as if Obama (and his counterparts in places such as France and Greece) are trying to do the greatest possible damage to the economy. In reality, of course, these politicians are simply trying to buy votes. But they need to understand that this shallow behavior imposes very high costs in terms of foregone growth. To elaborate, this video discusses the Rahn Curve, which augments the data in the World Bank study. As I argue in the video, even though most of the research shows that economic growth is maximized when government spending is about 20 percent of GDP, I think the real answer is that prosperity is maximized when the public sector consumes less than 10 percent of GDP. But since government in the United States is now consuming more than 40 percent of GDP (about as much as Spain! ), the first priority is to figure out some way of moving back in the right direction by restraining government so it grows slower than the private sector. I don’t blame Democrats for wanting to seduce Republicans into a tax-increase trap. Indeed, I completely understand why some Democrats said their top political goal was getting the GOP to surrender the no-tax-hike position. I’m mystified, though, why some Republicans are willing to walk into such a trap. If you were playing chess against someone, and that person kept pleading with you to make a certain move, wouldn’t you be a tad bit suspicious that your opponent really wasn’t trying to help you win? When I talk to the Republicans who are open to tax hikes, they sometimes admit that their party will suffer at the polls for agreeing to the hikes, but they say it’s the right thing to do because of all the government red ink. European nations, for instance, have been raising taxes for decades, almost always saying the higher taxes were necessary to balance budgets and control red ink. Yet that obviously hasn’t worked. Europe’s now in the middle of a fiscal crisis. Run up spending and debt, raise taxes in the naming of balancing the budget, but then watch as deficits rise and your credit-rating falls anyway. That’s been the sad pattern in Europe, and now it’s hitting that mecca of tax-and-spend government known as Illinois. …Moody’s downgraded Illinois state debt to A2 from A1, the lowest among the 50 states. That’s worse even than California. …This wasn’t supposed to happen. Only a year ago, Governor Pat Quinn and his fellow Democrats raised individual income taxes by 67% and the corporate tax rate by 46%. They did it to raise $7 billion in revenue, as the Governor put it, to “get Illinois back on fiscal sound footing” and improve the state’s credit rating. So much for that. …And—no surprise—in part because the tax increases have caused companies to leave Illinois, the state budget office confesses that as of this month the state still has $6.8 billion in unpaid bills and unaddressed obligations. At the risk of citing myself again, the number one message from this new ECB research is that lawmakers - at the very least - need to follow Mitchell’s Golden Rule and make sure government spending grows slower than the private sector. Fortunately, that can happen, as shown in this video.